I love the look of painted Mason jars, so in keeping with a summer theme, here is a Mason jar filled with a flower bouquet. I cased this card from Pinterest. The Mason jar stamp is so versatile and you can literally fill it with anything you want. My stamp is an older one, but there are lots of Mason jar stamps out there now. I used Wink of Stella to go over the stamped lines along the edges of the jar for a glassy effect. My flowers are from Color Pop Florals by Papertrey Ink. 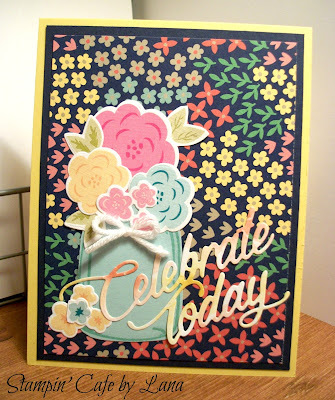 (See my previous post where I stenciled the flowers for a card background from the same set.) The patterned paper is from the Affectionately Yours DSP set of papers. I matted the DSP onto Night of Navy cardstock and my card base is Daffodil Delight, all from Stampin' Up! The Celebrate Today is also from the Color Pop Florals set which included this die, along with the dies for the flowers. I die cut the words from a water color looking patterned paper in my stash and it really gave it an ombre effect. Finished card is 4-1/4 x 5-1/2 inches, Layers were each cut 1/4 inch smaller than the previous layer. I have another Mason jar card in mind for next week, so if you are a fan of Mason jars, stay tuned! There is a link on the right if you would like to follow along!